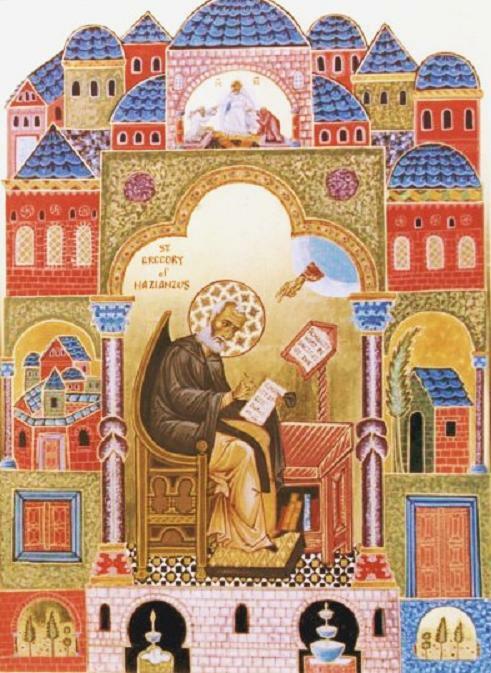 The works of Saint Gregory the Theologian include orations, letters, and poems. Everything he penned bears the mark of a polished rhetorician. His forty-five orations were used as models in the schools of rhetoric. His five Theological Orations, which were preached in the Church of the Resurrection in Constantinople, wherein he explains the Nicaean doctrine of the Trinity, won him the title of "Theologian". The first oration is a preliminary discourse against the Eunomians. With the second oration he speaks of the existence, nature, being, and attributes of God, insofar as man's finite intellect may comprehend the Trinity. Both the third and fourth theological orations speak of the divinity of the Son. The fifth oration is on the Holy Spirit. His most notable discourses and moral essays include a defense of his flight and treatises on his consecration to Sasima, on the plague of hail, on peace, on love of the poor, on the indissolubility of marriage, and on moderation in theological discussion, as well as a farewell discourse given at Constantinople. He also authored sermons for feasts, two for Pascha, one for the Nativity of our Lord, one for Theophany, and one for Pentecost. His panegyrics on saints include those to Saint Cyprian and Athanasius, and on the Maccabean brothers and their mother Solomonia. He also wrote political pamphlets, the two Invectives Against Julian. These were delivered at Nazianzus after the slaying of Julian. The orations mention the emperor's attempt to rebuild the temple at Jerusalem, and its failure, and his defeat in the Persian campaign. Saint Gregory illustrates the might of God's justice, and the consolation of His providence in our affairs. The Patrologia Graeca of Migne contains 243 epistles. They are finely written with his customary scrupulous attention to the rules of style, and elaborate Byzantine politesse, with dashes of wit and irony. His poems, written during the last ten years of his life, are filled with pertinent autobiographical data. During his latter years, Saint Gregory also included a collection of Saint Basil's letters with his own, and gave his friend the first place. When asked the reason for this, Gregory explains: "I have always preferred the great Basil to myself, though he was of the contrary opinion; and so I do now, not less for truth's sake than for friendship's. This is the reason why I have given his letters the first place and my own the second. For I hope we two will always be coupled together; and also I would supply others with an example of modesty and submission" (Div. III, 8, Ep. liii, "To Nocobulus"). From The Great Synaxarion of the Orthodox Church (January), translated by Holy Apostles Convent, pp. 1044-1046.